All of my items are guaranteed to be old and original! These Sellers measuring cups were a part of the canister set and were included with the cabinets when purchased new. Sellers made their measuring cups with markings that I've always called a pyramid style where they used "steps" for the measure marks (1/4 cup marks on one side and 1/3 cup marks on the other. both a wide and a narrow pyramid style were produced. This cup is in good condition, It does have a couple of small chips on the lip of the base (shown in last picture) and a straw mark across the bottom which is from when it was made.. It is embossed on the base "SELLERS PAT.-APLD.FOR"
This cup does have one small chip off the inner top lip to the right of the 1/3 cup marks where it was most likely tapped with a spoon. There are also bubbles in the glass and some slight roughness around the top lip and base and some minor marks from normal use. There is also one piece of carbon that is below the 2nd "E" in Sellers in the base. It is embossed on the base "SELLERS PAT.-APLD.FOR"
This cup is embossed in the base with "Sellers". I suspect that these were made by U.S. Glass for Sellers as they were the only company I know of that used the "slick handle" design. There is some very light chipping around the inside edge but overall it looks almost unused. 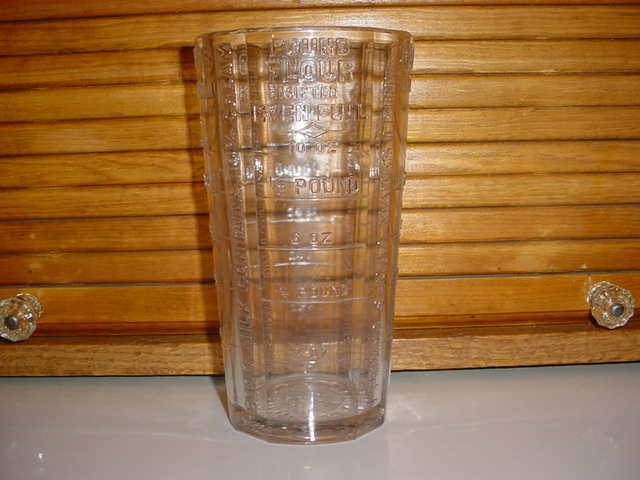 This is a Federal Glass Co. three spout measuring cup that is embossed with the "F" in a shield in the base. It has three spouts for pouring and does not have a handle. There are no chips or cracks. Same as above except in green. Also no chips or cracks. Same as top but in clear. It does have some very minor marks on the inside rim. I believe that these were most likely from the cooling process as they are not on the top edge but rather on the inside where the glass would have been stretched when the spouts were formed. This Federal Glass Co. measuring cup just screams Art Deco. They were definitely going more for looks rather than usefulness when they produced this as the handle is almost impossible hold onto or use. A beautiful cup to display with no chips or cracks. 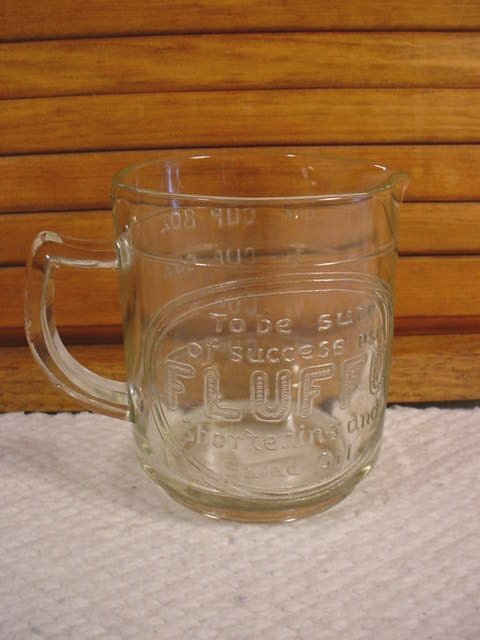 This cup was a give-away when you purchased Fluffo products. The cup is embossed "To be sure of success use Fluffo Shortening and Salad Oil. There are measurement marks in 1/4 cup increments on the back side and two small shallow chips (under 1/4 inch) on the handle. This is a green three spout measuring cup that is embossed with the "H" over "A" mark on the bottom. Marked in 1/4 cup increments on one side and 1/3rd on the other. There are some marks in the glass from manufacture and one small bruise on the edge of the base (no missing glass) below the handle. This is a pink three spout measuring cup that is embossed with the "H" over "A" mark on the bottom. Marked in 1/4 cup increments on one side and 1/3rd on the other. There is one small area on the lower edge that could be either a flake or a defect from manufacture. 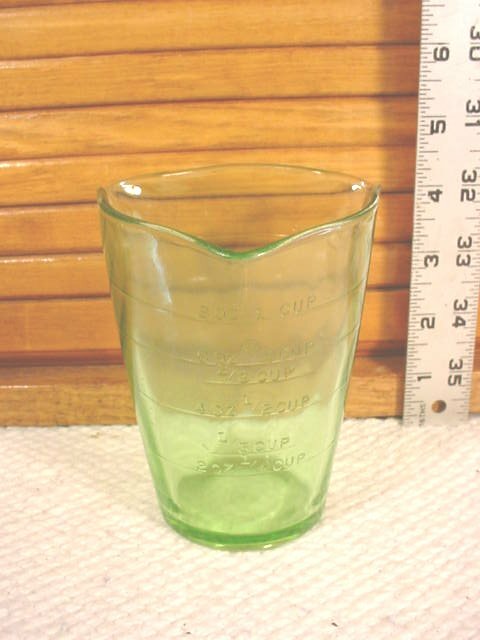 A green three spout measuring cup that is embossed "Kellogg's" on the base. There is honest shelf wear on the base of this cup. Marked in 1/4 cup and oz. increments on one side and 1/3rd on the other. There are no chips or cracks. 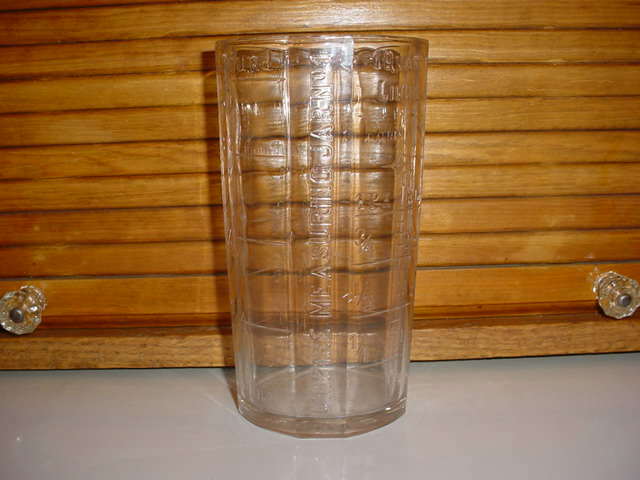 This cup was a give-away with Kellogg's Bran Flakes in Canada (you also got a recipe for bran muffins). It has a stylized "K" in a circle embossed in the base. It is marked in 1/4 cup and oz. increments on one side and 1/3rd on the other. There is one small straw mark in the base and one larger one on the 1/3 cup side, but no chips or cracks. 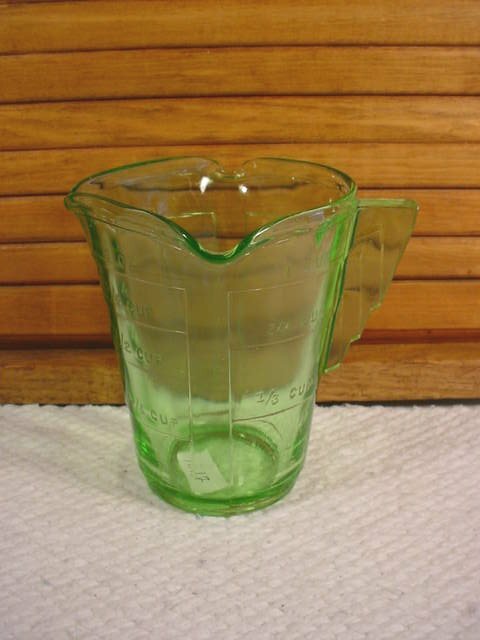 A green glass one cup measuring cup with a single very large pouring spout. It is marked in 1/4 cup and oz. increments on one side and 1/3rd on the other. It has honest shelf-wear on the base but no chips or cracks. An unmarked green glass one cup measuring cup with three large pouring spouts that I believe was made by Hocking Glass Co. It is marked in 1/4 cup and oz. increments on one side and 1/3rd on the other. It has no chips or cracks. The "D" inside a diamond on the base signifies that this was manufactured by Dominion Glass in Canada. They had facilities in Montreal, Quebec as well as other locations. It has 1/4 cup and ounce markings on one side and 1/3 cup marks on the other with no chips or cracks. 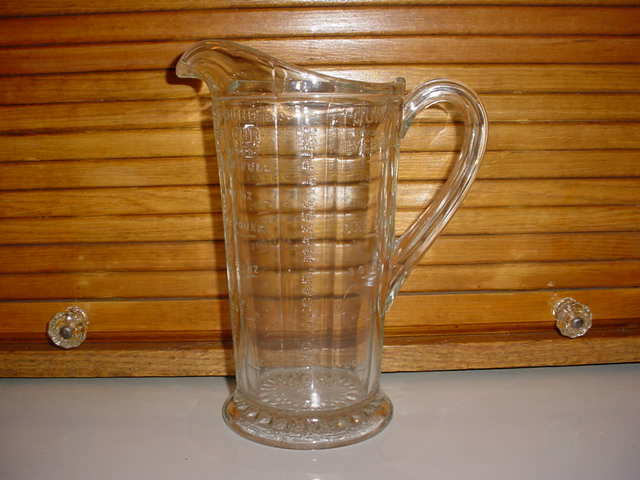 The manufacturer is of this unusual three spout measuring cup with wavy glass on the outside wall is unknown. It has 1/4 cup marks on one side and 2 - 8 ounce marks on the other. In very nice condition with no chips or cracks. This is a Fire King blue tint one spout one cup measuring cup. It is embossed on the base with Fire-King Oven Glass. There are some minor defects in the glass from manufacture, but no chips or cracks. 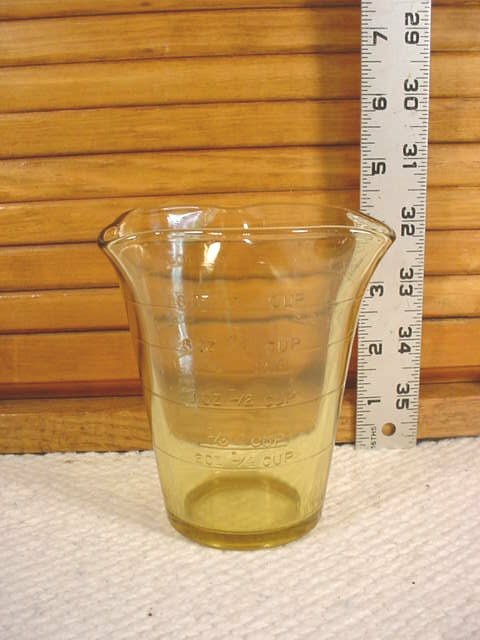 This is a measuring cup that was made to measure dry ingredients with the measure marks ending even with the rim. There are measurements in oz. and 1/4 and 1/2 pints on one side and measurements for 1/4 and 1/8th lb. flour, 1/4 and 1/2 lb. Gran Sug., tablespoons and 1/4, 1/3rd and full cup increments on the opposite side. There is some chipping around the top rim and some straw marks in the glass. I believe this most likely pre-dates the depression years. 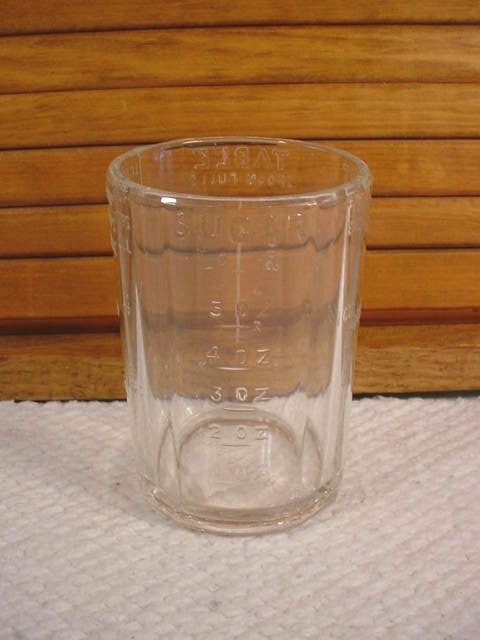 This is a measuring cup that was made to measure dry ingredients with the measure marks ending even with the rim. It is marked in 1/4 cup increments on one side and 1/3rd cup marks on the other. On the base it is marked Patd Dec. 8, 25 There are a few minor chips around the inner rim and where the top of the handle attaches appears to have a manufacturing flaw. Dry Measuring Cup Napanee Milling Co. This is an advertising cup put out by the Napanee Milling Co. The base is marked "The Napanee Milling Company Napanee, Indiana" written around the outside edge and then "Millers of high quality family flour every sack guaranteed" in the center. The measure marks are done in a pyramid style like the Sellers cups with 1/4 cup marks on one side and 1/3 on the other. There are some light chips on the inside lip over the measure marks where it was most likely tapped with a spoon. Manufactured by and embossed in the base with "Silver & Co." (who also sold beaters) in New York right around the turn of the century this measuring cup pre-dates the measuring cups we use today and has measurements on the four sides for Sugar in oz., 1 gill and oz. 1/2 pint even full, Table spoon-fulls for sugar and liquids, and 1coffee cup or 2 "T" cups even full and 1 wine glass. Some of these measuring jars date back to the late 1800's, all have measured scales for Liquids by Weight, Quart, Pint, and Gill and by Tea and Coffee Cups. Dry Measure (Flour) by 1/4 pounds and ounces. 1 pound sugar makes 1 pint, 1 pound butter makes 1 pint, Good milk contains 10% cream.